Western blot analysis of extracts from HeLa cells 48 hours following mock transfection, transfection with non-targeted (control) siRNA or transfection with Caspase-3 siRNA (33 nM). 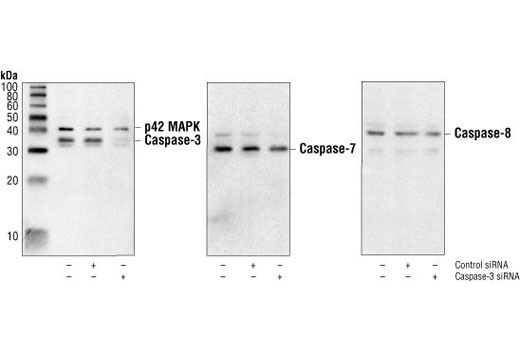 Caspase-3 was detected using Caspase-3 Rabbit Monoclonal Antibody #9665, and p42 MAPK was detected using p42 MAPK Antibody #9108 (left). The same lysates were also probed with antibodies against Caspase-7 #9492 (middle) or Caspase-8 #9746 (right) to confirm siRNA specificity. Fluorescent detection of SignalSilence® Control siRNA (Fluorescein Conjugate) #6201 in living HeLa cells 24 hours post-transfection, demonstrating nearly 100% transfection efficiency. CST recommends transfection with 33 nM Caspase-3 siRNA. Decreased Caspase-3 expression was seen 24-72 hours post-transfection. See Protocol for transfection procedure. 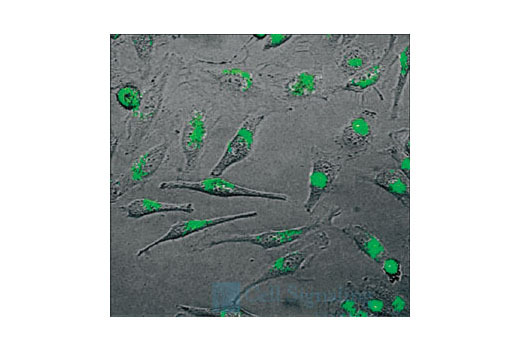 SignalSilence® Pool Caspase-3 siRNA allows the researcher to specifically inhibit Caspase-3 expression using RNA interference, a method in which gene expression can be selectively silenced through the delivery of double stranded RNA molecules into the cell. The Caspase-3 siRNA is a hetergeneous mixture of 21-22 bp siRNAs. A 433 bp cDNA template of caspase-3 was transcribed by T7 RNA polymerase to create double-stranded RNA (dsRNA). RNase III was used to cleave the dsRNA in the presence of manganese buffer to 21-22 bp siRNA. All SignalSilence® siRNA are rigorously tested in-house and have been shown to reduce protein expression in specified cell lines. Caspase-3 (CPP-32, Apoptain, Yama, SCA-1) is a critical executioner of apoptosis, as it is either partially or totally responsible for the proteolytic cleavage of many key proteins, such as the nuclear enzyme poly (ADP-ribose) polymerase (PARP) (1). Activation of caspase-3 requires proteolytic processing of its inactive zymogen into activated p17 and p12 fragments. Cleavage of caspase-3 requires the aspartic acid residue at the P1 position (2). Fernandes-Alnemri, T. et al. (1994) J Biol Chem 269, 30761-4. Nicholson, D.W. et al. (1995) Nature 376, 37-43.